I know we as Catholics are called by Christ to be merciful. I know that Pope Francis has spoken not a small deal about mercy and about God's mercy. 'Mercy' is central to the Kasper proposal, but his is a mercy that is not rooted in the Gospel. It is, rather, a new Gospel devoted to mercy, but it isn't Christ's Gospel. My understanding of God's mercy is that His mercy - available to all who desire it - isn't there for no reason. It isn't there to make us feel 'accepted' in a community. 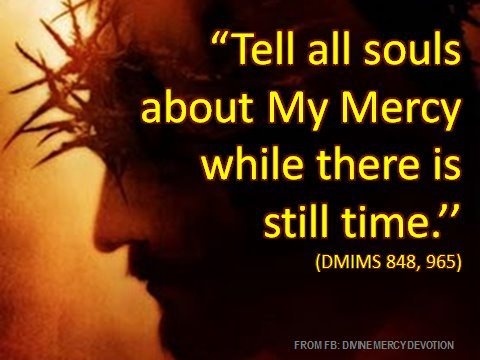 God's mercy is His very, very, very loving response to the scandal, the detestable offense that is our sin. As others have noted, mercy is certainly there as a theme in the Gospel, but it isn't the central theme. The central theme is Jesus Himself. What is so special and wonderful about God's mercy? It is God's great mercy that saves us. What does God's mercy save us from? Sin and the consequences of our sin. What are the consequences of our sin? If mortal, that'll be eternal damnation. Of course, there are other consequences to our sins too, in this life. Family break-up, addictions, self-destructive behaviour, societal breakdown and others, but you would think that the prelates banging on about mercy 24/7 would have some inkling - and at least mention it - as to why, in Catholic understanding, God's mercy is so wonderful and treasurable, why it should be proclaimed. Alas, it doesn't seem to sink in. Many bishops can say the word 'mercy' a thousand times and never - for a moment - consider what the spiritual effects of God's mercy are - the bringing of the soul from death - eternal death, to life - Eternal Life. Yes, that's what happens when 'Pastors' think they are more 'merciful' than Christ. The Church's teaching is REAL mercy because it reminds all who attend the Most Holy Sacrifice of the Mass that reception of the Body and Blood of Jesus is neither a 'reward for the just' or 'medicine for the weak' but essentially the embracing of Communion with Jesus Christ. If we are not in Communion with Him, we should not receive Him because He is Holy. To receive Him in mortal sin is sacrilege. Yes, we should be merciful. Priests and Bishops should be merciful, but when we are taught by Christ to be merciful in the Beatitudes it is with some purpose in mind. 'Blessed are the merciful, for they shall obtain mercy'. Why do we want to 'obtain mercy'? In a nutshell, so that we may avoid the eternal punishments of Hell and gain admittance into Heaven. Our Lord in the Gospel tells us that the unmerciful will not be shown mercy because that would insult His Justice, but there is zero evidence that within His definition of the 'unmerciful' are those pastors who follow the Church's discipline of not giving unrepentant mortal sinners the impression that their sin no longer matters, for the sake of their eternal salvation. Ah, yes, the eternal punishments of hell. That's what the Immortal Loving Word holds in store for those who don't match up to His expectations during the puny span of life He affords them, whatever that may be. A certain prescription to bring the faithful flooding back. Simple, really, Mr Bones, as you always tell us: God as Penal Terror for the terrified; it's all black and white if only we could see our way clear to losing the colour. That way salvation surely lies. What does Jesus save us from if it is not, ultimately, Hell? I was once called to go down to Casualty to see a woman who had fallen and injured herself on a country walk some days before, resulting in a small but deepish wound. The attending doctor had stitched it up and sent her on her way with the advice to come back in a week to have the stitches removed. Once I took the dressing off I knew we had trouble. The wound was red and swollen, angry looking. The stitches were barely holding and one fell out as I probed, the gap revealing pus and some muck, including a mouldering dead leaf, which the original doctor, having not cleaned the wound properly, had stitched inside to fester.....No need to labour the comparison, I hope. Anthony: Which would you prefer? Heaven or Hell? Jesus saves us from ourselves, I suspect. As for the rest, I know not but I hope it does not involve God visiting eternal punishment upon his creatures. One of the most vociferous groups calling for the false mercy which Bones describes is the German bishops – well, most of them, anyway. Yet this same group are the ones who condemn their compatriots to total deprivation of the Sacraments, including Communion, if they have the temerity to stop paying the Church Tax. If anyone objects that you can only stop paying the tax by signing a form which says you are withdrawing from the Church, I would point out that the German bishops criticised ‘a too-strict application of the rules’ from some of their Synod colleagues. (You can guess what those colleagues were saying.) So mercy to adulterers but no mercy to those who won’t pay the tax. Wow that's pretty gross. I once had to clean maggots out of a decubitus ulcer. Nasty stuff. Who is Jesus, and if He is really is God then why would He die on the cross except to save us from just as bad or worse fate.? If you deny the reality of hell then you have to deny that God was tortured and killed, and if you deny that Jesus was God He could only be a madman or a liar because He didn't give us the option to both accept His teachings and deny His divinity. So if you refuse His teachings you can't be a Christian nor take his world seriously and any respect you pretend to have for his teachings as a prophet or great man of God is lie because you'll accept only the teachings that you approve of. Anthony: People choose to go to Hell. Quite what the nature of hell is uncertain but it is somewhere deprived of the grace of God. God is always ready to welcome us into heaven if we so choose. Why should God deprive us of this liberty to choose? "Why do we want to 'obtain mercy'?" Faith and reason. Job recanted and relented. In this eschatalogical age, faith and reason demand the Blood of Christ; and the meaningless lies in the dissolving of the true altar. But reason and faith demands we continue to ask, seek and knock for the pearl of great price = Medieval hogwash. That, Nicolas, is a shifting of the ground to which I objected. If hell is self-deprivation of divine grace then it is not a punishment, at least not in the sense intended by our host. Yours is, of course, the current wisdom in this matter. What worries me about it is that in making our free choice sovereign, it necessarily introduces an apparently inequitable contingency in the occurrence of death which allows some a better and longer opportunity to repent. One might die at 18 in a state of mortal sin while an 80 year old finds it in him to repent just in time. Are we not then involved in some form of pre-destination and where does providence fit in? How can this work out? 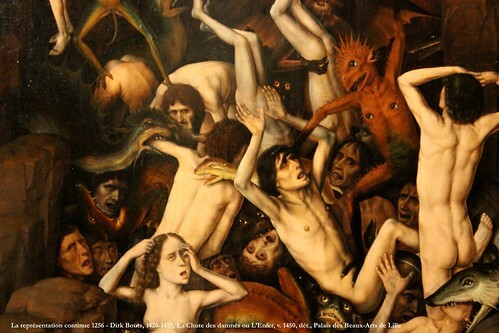 Purgatory is no answer, is it, in the case of mortal sin? I have always been tempted by Universalism which seems to me more consistent with infinite Love and not necessarily incompatible with free will. Alas, that is heresy and needs some thinking through in any event. Nothing easy, at least not for me. Anthony: I think speculating about the nature of heaven and hell is probably a waste of time. But I suspect that those who stick with sin are unhappy and they will be unhappy in hell - they punish themselves. I suspect everyone gets a change to repent at some point even the 18 year old who falls under a bus. As to Universalism it is perfectly legitimate to believe that everyone may get to heaven but to believe that everyone will, regardless of the state of their souls, is very dangerous. It has been said that Cardinal Cormac is a Universalist and would therefore believe that however sinful someone is they get to heaven. This would explain his failure to take proper action to correct certain situations as sin no longer matters.